When days are long and the sun shining, there’s no better place than Alaska. We left a dinner at 10 tonight and drove to another, surrounded by brilliantly blue skies, balding mountains, and balmy 74° temperatures. 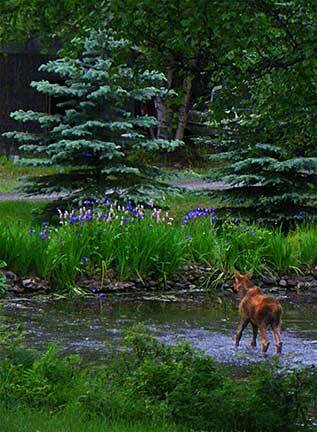 Arriving home, a baby moose was happily frolicking in the pond. Hard to believe it snowed less than a month ago. It’s now 11:40 pm. The sun has abandoned us, but blue skies are peeking through luminescent evening light. I spent the day cooking, with happy results. For lunch, I made Green Gazpacho with dandelion greens and spruce tips, a cool solution for hot weather meals (the same gazpacho made with spinach and herbs is also delicious). Served ice cold, jalapeños (optional) give Green Gazpacho a nice punch. For the first dinner, I made Cow Parsnip Kimchi (could’ve been kale kimchi) and added it to Fresh Spring Rolls. As we basked in glorious sunshine, Kimchi Spring Rolls rapidly disappeared; the kimchi is surprisingly delicious. Finally, I made Cheesy Polenta Pie with Yarrow and Onion Filling. Yarrow is an oft-overlooked green. Harvested when leaves are young and flowers not yet formed, yarrow has a pleasantly herbal and slightly peppery flavor. 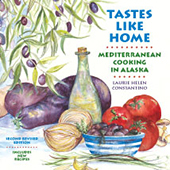 Sautéed onions lend flavor to the filling; their sweetness balances yarrow’s mild bitterness. Swiss Chard or Kale may be used instead of yarrow. 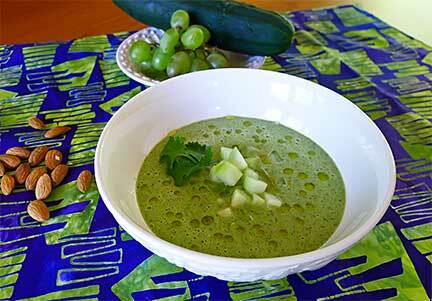 I just posted my Green Gazpacho recipe. 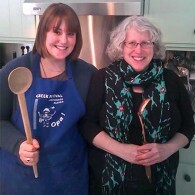 I’ll post Cow Parsnip Kimchi, Kimchi Spring Rolls, and Cheesy Polenta Pie recipe in the near future. Next Post: It’s Summer! It’s Hot. Where’s the Ice Cream?